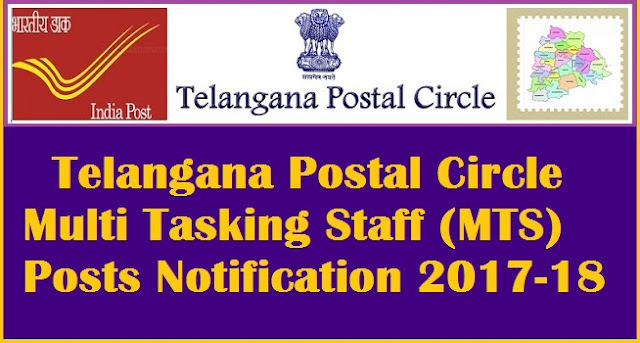 Department of Posts, Office of the Chief Postmaster General , Telangana Postal Circle , Hyderabad has issued a recruitment notification on 09-12-2017 and the Department of Posts invites applications from the eligible and interested Candidates to fill up 33 Multi Tasking Staff Vacancies of the year 2017 in Telangana Postal circle, Hyderabad. Applications are invited from the eligible candidates to fill up the posts of Multi Tasking Staff in the following Units in Telangana Postal circle in the pay scale of Rs18000/- in level of pay matrix as per 7th CPC +admissible allowances prescribed from time to time in accordance with Department of Posts (Multi Tasking Staff Group C , Non- Gazetted) Recruitment Rules 2015 notified in GOI Gazette No GSR 383(E) ,Gazette of India Extraordinary , Part II section 3 Sub section (i) dtd 14-5-2015. Candidates age limit should have between 18 to 25 years for General Category. The applicable relaxation is provided to persons belonging to SC/ST/OBC/PH/Ex-servicemen candidates as per the extant orders. Candidates should have Matriculation/ SSC or ITI from a recognized Board(Excluding vocational streams). Pay Band: The pay scale of Rs18000/- in level of pay matrix as per ]1h CPC +admissible allowances prescribed from time to time in accordance with Department of Posts (Multi Tasking Staff Group C , Non- Gazetted) Recruitment Rules 2015 notified in GOI Gazette No GSR 383(E) ,Gazette of India Extraordinary , Part II section 3 Sub section (i) dtd 14-5-2015. Based on the marks obtained in the Aptitude Test, a merit list of qualified candidates will be prepared in each Postal/RMS Division separately. As per the availability of vacancies as notified above, selection will be made in the respective unit based on the merit list among the candidates applied for that particular Division/Unit only. Candidates belonging to SC/ST/PH/Women are exempted from payment of Examination fee. The aspiring applicants are requested to access the TS Postal official website Go to official site http://www.telanganapostalcircle.infor all other full details like vacancies eligibility criteria etc., Application are to be submitted online and the registration for online applications commences from 09-12-2017 and last date of registration of applications online is 08-01-2018.